When I decided to switch from a two-handed backhand to one-handed I knew that the first thing to learn was the technique. A few hundreds of shots against the wall, then a few hours of rallying with my practice partner, made me confident that from there one I should be able to apply my newly learned one-handed backhand in matches. This is where things got interesting… not in a good way. My new one-handed backhand was actually not a reliable shot when nerves took over and fear of missing my backhand made my muscles tight and my strokes became a “push” and depth was a matter of barely getting the ball over the net. What happened, you might say…? Having confidence in our tennis strokes is a process that should be understood and built through smart progressions and repetitions. It is one thing to be able to hit a tennis shot technically well, which is different than the ability to execute your shot under pressure, consistently. So let’s go back to the main idea of this article: how to improve your ground-strokes consistency… under pressure. There is a progression that I would like to suggest to you. Following it, you might be able after all to hit your one-handed backhand, volley or forehand ground-stroke with the consistency that you desire. So here we go! Spend some time studying the pros but don’t expect to hit like them any time soon. After all, if you spend as many hours on the court as they do, then yes, you might expect to play like them. Learn the proper progression drills or step-by-step technical elements of the strokes. 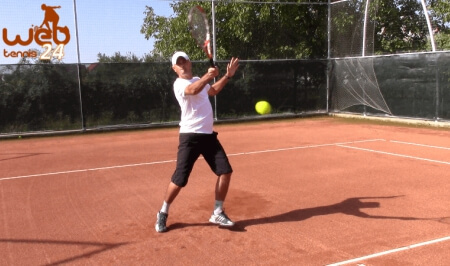 I taught myself how to hit a one-handed backhand in a few days only because I followed a simple progression beginning with the point of contact and adding the follow-through (click here to find out how). Once you understand the importance of the main elements, the rest comes easy. My favourite way of practicing the technique is with a ball machine. There is no pressure from a tennis partner or a coach to perform in a certain way. Of course, having a certified tennis coach has definitely a lot of advantages because he/she will give you the feedback you need to improve a lot faster. But if you know what you need to do and follow a progression process (see above) using a ball machine is one of the best ways to learn and improve your tennis strokes. And the third way would be to find a “patient” practice partner who is willing to toss some balls for you and give you feedback. Tip: Filming yourself playing/practicing is a great way to get feedback and analyse the aspects you need to improve. Once you become comfortable with the technical part and add in some low pressure practice, the next step would be to move on to drills in which you rally with a practice partner. 1) Consistency – rally with a partner trying to achieve a certain number of balls you hit in a row (no mistake) over the net; eg. 25 shots in a row and if a mistake is made start it all over. 2) Placement – the next step is the ability to place/direct the ball to a certain area of the court (e.g. 20 backhands cross-court; 20 forehands down-the-line; then aim for more). Again, you can do this consistency and placement practice with a partner, or using a ball machine. This is the next level of learning and improving your ground-strokes before applying it in a match. Once I had a tennis student, an older gentleman who was well educated and accomplished professional in the medical field. He hired me to teach him how to play his forehand using a “modern” grip, the semi-western. Up to that point he was hitting his forehand ground-stroke using a continental grip (also called “hammer”). It took me a couple of lessons to teach him the concept of hitting with a semi-western grip (new stance, point of contact, swing). And then he was eager to show his doubles buddies his new and improved forehand. Despite the fact that I cautioned him of not being ready to apply it in a pressure situation, he was confident that he was ready. Under the excitement of showing his friends his new forehand, he put too much pressure on him and got tense. He was playing in a different environment than the one he learned his new stroke: in front of his buddies he was not as relaxed than he was on his private court and under my positive encouragement. – So what should had he done? He should had followed the steps highlighted above and once he got to step 4 (this one), he needed to play some drills and games to introduce his newly ground-stroke to friendly, no pressure competitions. Then increase the pressure by playing more games and drills with friends or his tennis coach. After you followed the previous steps, invite your tennis practice partner to play a few sets where you use the ground-stroke technique you just improved. You might still be afraid to hit at full speed out of fear of missing long or into the net. What you need to do is tell your partner that you won’t be chasing a win out of this match; instead your focus will be to see how you can handle the score pressure and how your shots will fair in different situations (being pulled wide, short balls, deep balls etc.). It is important to communicate the above to your partner so that he understands that you have a higher purpose than just winning a match. Your goal is to improve a stroke that still needs to get better. These are mental notes that you can use to improve your stroke at your next practice session. Be patient and take your time to analyse your shots under a low pressure match. Then go back to more practice on the areas that need extra work. 6. After all that analysis you are now ready to apply your new stroke in a competitive and high pressure situation: local tennis tournaments and even further. As you can see, there is no short cut to playing your best tennis. Patience and lots of work is necessary to reach your true potential. It can be done – have a progressive system and you will learn or improve how to play your ground-strokes consistently, even under pressure.